Download latest version of Zemana AntiLogger free from direct download link. You can read the description according to its developer now. 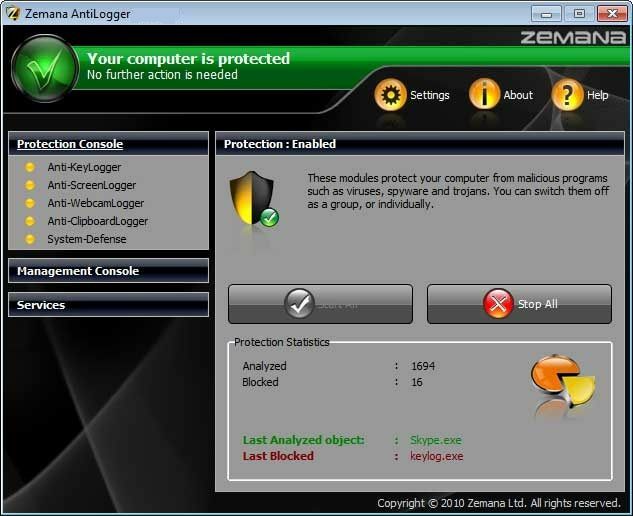 Zemana AntiLogger is a powerful, efficient, and lightweight app that blocks hackers. It detects any attempts to modify your computer’s settings, record your activities, hook to your PC’s sensitive processes, or inject malicious code in your system. Financial Malware Protection: The vast majority of banking and financial transactions take place on SSL‐protected secure sites whose URLs begin with https. SSL data encryption reliably secures your data during online shopping and financial transactions, but hackers have found a vulnerable spot. Cloud Powered Early Response System: Zemana’s IntelliGuard is a smart early warning and response system that makes the AntiLogger easier to use and more reliable than ever before. Through IntelliGuard, your AntiLogger references in real time the latest community intelligence base of threats; and threats detected on your computer are scanned against over 40 malicious files databases and known bad files are blocked automatically. With IntelliGuard you will not receive prompts about legitimate programs you are installing on your computer. Webcam and Microphone Hijacking Protection: Yes, it is possible that your webcam and microphone can be turned on remotely, and if a pro is doing this, the status LED on your webcam will remain off. Your webcam can be turned into a surveillance camera; and while the hackers won’t be able to drain your bank account or hijack your email, this is very intrusive and unpleasant. What if this were your child’s computer? Zemana AntiLogger constantly monitors all processes accessing your computer and will prompt you when an illegal application is trying to switch it on. Read a testimonial one of our users sent to us. System Intrusion Protection: Malware relies on invading your system’s sensitive areas, like its registry and physical memory (RAM), so it can inject its malicious code and seize control of your PC. The AntiLogger’s System Defense module secures the very heart of your PC in a future‐proof way: it detects malicious attempts based purely upon their behavior, regardless of whether or not the malware attacking you has been identified, isolated, analyzed and your signature database updated.